A year ago, when the heads of Detroit’s Big Three – GM’s Rick Wagoner, Ford’s Alan Mulally, and Chrysler’s Bob Nardelli – appeared in the infamous Capitol Hill bailout hearings, many lawmakers, and many Americans, decided that this trio from the industrial heartland could all be tarred with the bad-CEO brush. There was a telling moment, during a discussion about executive compensation, when the three CEOs were asked if they were willing to work for a dollar a year. Mulally’s polite reply, “I think I’m OK where I am,” was a juicy piece of red meat for the national media, who were as one in their downright contempt for these three men and the industry they represented. CNN’s Anderson Cooper literally sneered in disgust. The truth of the matter was hard to ascertain in that politically charged Senate hearing room, but it’s now obvious: Alan Mulally was, and is, worth whatever Ford is paying him, because he has almost single-handedly saved the automaker. The Ford Motor Company, unlike its two Detroit rivals, has not declared bankruptcy and has not dipped its hand into the TARP trough. (In fact, Mulally took a 30 percent pay cut and declared that he would indeed reduce his salary to $1 per year if Ford took government funds. “I’ll do well when Ford does well,” he tells us.) Ford stands alone as the sole Big Three automaker that is still an independent entity. For this achievement, and for steering Ford onto a clearly defined road toward success, Alan Mulally is Automobile Magazine’s 2010 Man of the Year. 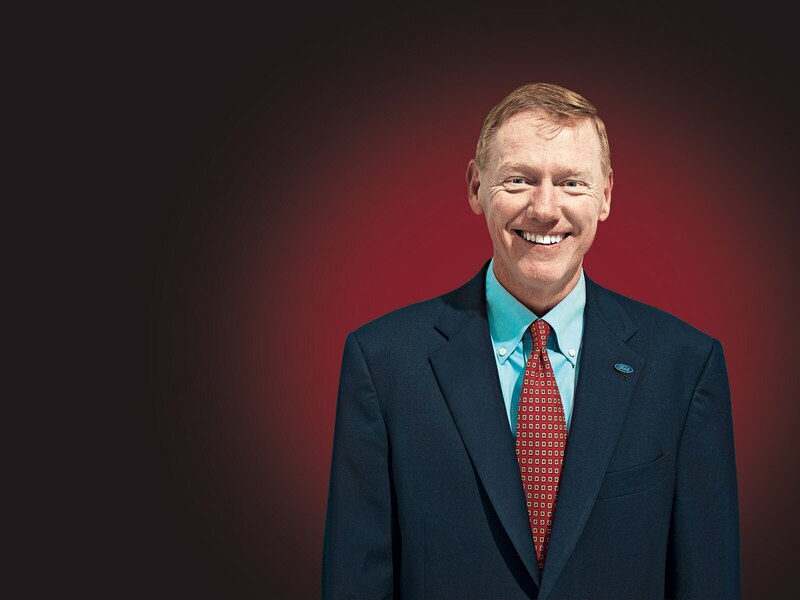 Mulally is living proof that a single, extraordinary leader with vision and determination really can make all the difference in an organization. In 2006, when Bill Ford, Jr., went shopping for someone to take over the role of Ford CEO, he was looking for not just a talented executive but for someone who had demonstrated the ability to reinvent and reimagine an entire corporate culture. Candidates were thin on the ground, but Mr. Ford found his man, the father of the Boeing 777 airliner, in the number-two chair at the aircraft manufacturer. Industry observers were shocked: never had someone with absolutely no car experience been appointed to such a high position. But Mulally wasted little time proving his worth as he sensed, long before crosstown rivals, that the automotive business was about to get extremely difficult. His first task was to ensure that Ford had enough cash on hand to weather a recessionary storm, so he mortgaged all of Ford’s assets, including the blue-oval brand itself, on Wall Street and netted $23.5 billion. “I spoke to a room with over 500 bankers,” he recalls. “Why did they give us the money? Because we had a plan.” At the time, though, Ford seemed desperate, especially since its product portfolio was in disarray compared with GM’s. In fact, Mulally was dismayed to discover that the company’s famous nameplate, Taurus, had been thrown on the scrap heap. One of his first and best-known decisions was to resurrect it. Mulally, a Kansas native who eschews tailored suits for khakis and blue blazers, has also brought what he calls a “laser focus” to the Ford brand. The company’s core operations had been neglected for years by FoMoCo executives in favor of Ford’s seemingly more glamorous acquisitions, Jaguar, Land Rover, Aston Martin, Volvo, and Mazda. Mulally reduced Ford’s stake in the latter and has sold off all of the other expensive baubles except Volvo, which might have a new owner by the time you read this. The Ford brand is now king in Dearborn, and Lincoln, also long neglected, is the crown prince. Ford suffered for years from an insular, back-stabbing executive culture with fiefdoms spread around the globe that paralyzed the company’s decision-making. Mulally has managed to unite (or send packing) these competing factions and establish an executive team – composed largely of Ford veterans – whose members actually work together for a common purpose. Sounds simple, but this wasn’t always the case at FoMoCo. Ford is also fully leveraging its worldwide capabilities, finally answering the pleas of American enthusiasts who long have coveted the cool Fords sold in Europe. To Mulally, the Boeing veteran, this only makes sense: “We didn’t have one 737 for the United States and another one we made for the rest of the world,” he remarks wryly. Next summer, we’ll get the Fiesta, a world-class small car that was designed and engineered in Germany and Belgium, and we’ll also get the new global Focus. To be sure, Ford is hardly out of the woods. The carmaker is still hemorrhaging cash and is buried under an avalanche of debt, and Mulally admits that Ford won’t make a profit until at least 2011. And although Mulally has brought clarity to Ford’s product lineup, his efforts there are only a first step. Ford is still relying too heavily on reworked versions of aged platforms from Volvo and Mazda, and the Dearborn engineering crew’s knowledge base is still skewed too heavily toward trucks and SUVs. The Fusion Hybrid is great, but the handsome new Taurus falls short of world-class status. Despite these challenges, the Ford Motor Company is in a position to succeed and to capitalize on the public goodwill generated by saying “no, thanks” to the Feds. The company is just beginning to find its way, but with Alan Mulally at the wheel, we’re confident it will soon not simply survive, but prosper.